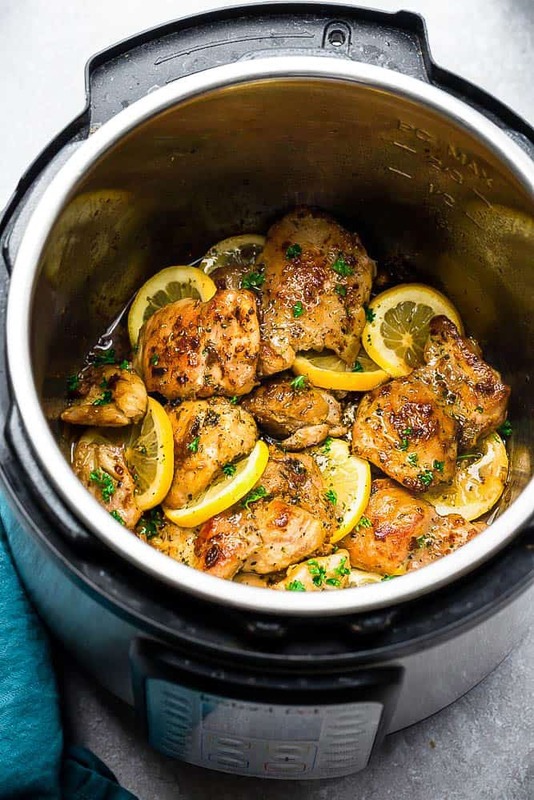 Instant Pot Lemon Butter Chicken – a flavorful one pot low carb recipe made in the pressure cooker is the perfect easy meal for busy weeknights. Best of all, the chicken cooks up tender and juicy in a buttery lemon garlic sauce. Easy Instant Pot recipes are my go to during the busy school week. I love using our Instant Pot since you can get dinner on the table quickly without having to plan ahead. This Instant Pot Lemon Butter Chicken comes together quickly and perfect for busy weeknights. The chicken cooks up tender, juicy and bursting with delicious flavor. You just can’t beat the combo of lemon, butter and garlic with chicken. The acidity in the lemon brightens up the flavors so much in this dish. And the best part about this recipe? Dinner can be on the table in about 30 minutes with the help of a trusty pressure cooker. IS CREAMY LEMON BUTTER CHICKEN HEALTHY? 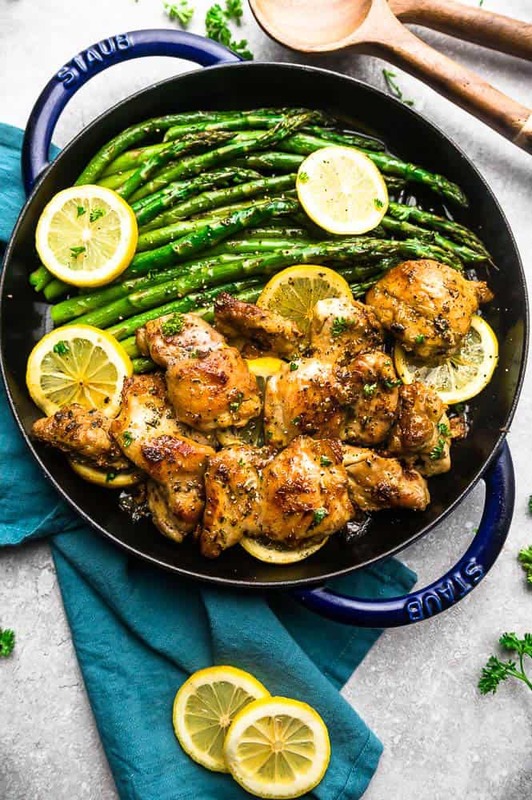 For this One Pan Lemon Chicken recipe, there is no added sugar and very minimal carbs so it fits great into a balanced lifestyle. Plus, it’s low in carbs, keto friendly, gluten free and dairy free if you leave out the cream. For a paleo lemon butter chicken or a Whole30 Lemon Chicken recipe, simply swap the butter for ghee and use coconut cream instead of heavy cream. You’re going to off by seasoning the chicken with some salt, black pepper and garlic powder. I used chicken thighs here but this dish would be delicious with chicken breasts as well. Next, you’re going to brown the chicken in the Instant Pot using the sauté function. Searing the chicken helps to seal in those amazing flavors and gives the chicken that crispy coating but feel free to skip the searing if you’re in a pinch. Seal the lid, turn the valve to SEALING and cook on HIGH PRESSURE for 7 minutes. Keep in mind that it will take about 5-10 minutes to come to pressure and start counting down. Remove chicken from Instant Pot using tongs and set aside on a large serving plate. Stir in heavy cream (if using) into the Instant Pot. (**If you like your sauce thicker – you can thicken with 1/2 teaspoon of xanthan gum or a cornstarch slurry (if not low carb). Press off and turn Instant Pot to SAUTE function. Cook and allow sauce to bubble and thicken. Turn off and add chicken back to the Instant Pot to coat with sauce. Sprinkle chicken with chopped parsley and serve hot with your favorite sides. Spoon sauce over chicken and garnish with lemon slices, if desired. 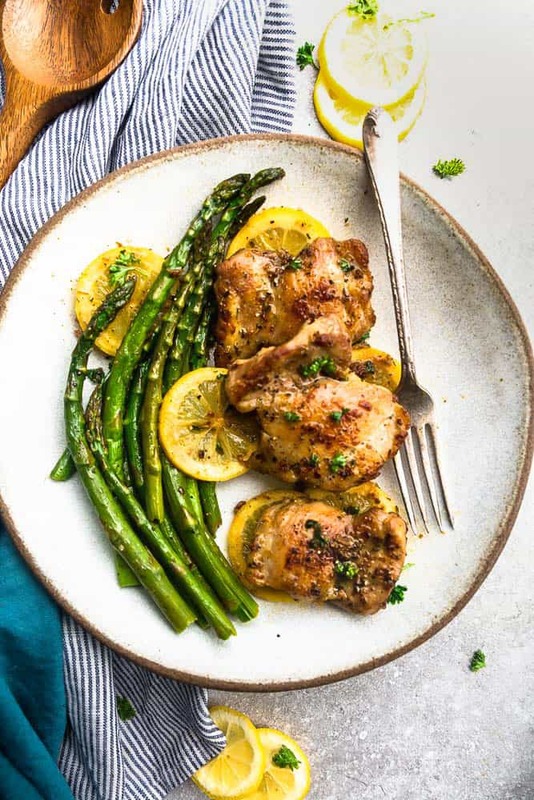 Serve this Instant Pot lemon garlic chicken with a salad, cauliflower rice or spiralized zucchini noodles. 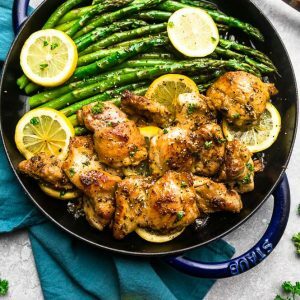 HOW DO YOU MAKE LEMON BUTTER CHICKEN IN A PAN? Return pan back to heat and melt butter. Stir in onion and garlic. Add lemon juice to deglaze the pan and cook for 1 minute. Add Italian seasoning, lemon zest, and chicken broth. Stir in heavy cream [if you like your sauce thicker – you can thicken with a cornstarch slurry (if not low carb) or arrowroot starch slurry (or xanthan gum) by mixing 1/2 teaspoon cornstarch (arrowroot starch) mixed with 1 teaspoon cold water]. Once the sauce has bubbled and thickened up slightly, add the chicken back into the pan until hot. Spoon sauce over chicken and sprinkle with chopped parsley. Serve with your favorite sides and garnish with lemon slices, if desired. If you just want to make the lemon cream sauce for the chicken separately, you’re going to need to melt the butter in a saucepan then saute the onions and garlic until fragrant. Next, add the lemon juice, seasonings then stir in the heavy cream. If you want a thicker sauce, you can add xanthan gum or a cornstarch slurry. IS LEMON BUTTER CHICKEN FREEZER-FRIENDLY? The great thing about most chicken recipes it that you can make them ahead of time on your Sunday or Monday meal prep day. Store the chicken in an airtight container either in the fridge for 3-4 days or in the freezer for up to 3 months. WHAT SIDES CAN I SERVE WITH LEMON BUTTER CHICKEN? This creamy lemon chicken would go well with so many sides. I chose to serve it with some asparagus since it’s one of my favorite spring vegetables but broccoli, zucchini or cauliflower would be delicious as well. 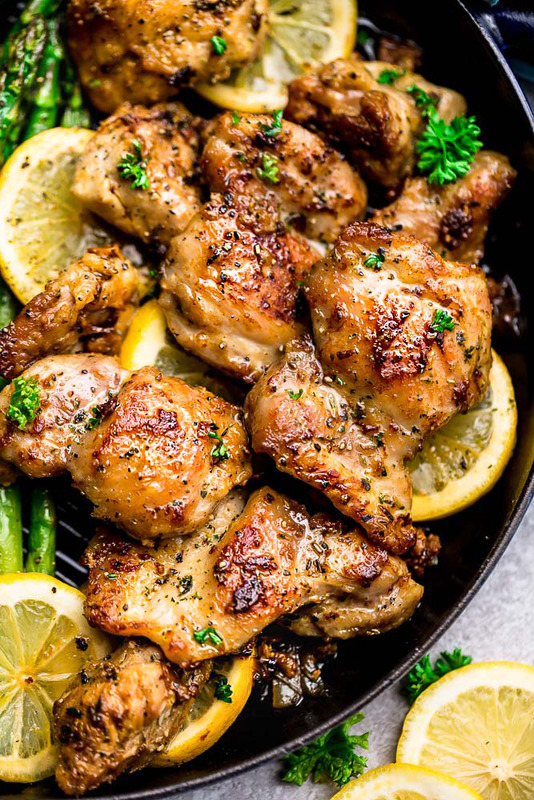 This Instant Pot Lemon Butter Chicken is quick and easy dish bursting with bright and fresh flavors. It’s also low in carbs, keto friendly and perfect for spring. For a paleo friendly version, use homemade chicken broth and swap out the butter with ghee or coconut oil instead. Season the chicken with salt, pepper, garlic powder, paprika, and chili flakes. Melt butter in Instant Pot and stir in the onions and garlic. Add lemon juice to deglaze pan and cook for 1 minute. Add Italian seasoning, lemon zest, and chicken broth. Remove chicken from Instant Pot using tongs and set aside on a large serving plate. Stir in cream (if using) into the Instant Pot. If you like your sauce thicker - you can thicken with a cornstarch slurry (if not low carb) or arrowroot starch slurry (or xanthan gum) by mixing 1/2 teaspoon cornstarch (arrowroot starch) mixed with 1 teaspoon cold water). Press off and turn Instant Pot to SAUTE function. Cook and allow the sauce to bubble and thicken. Turn off and add chicken back to the Instant Pot to coat with sauce. Spoon sauce over chicken and sprinkle with chopped parsley. Serve with your favorite sides and garnish with lemon slices, if desired. Return pan back to heat and melt butter. Stir in onion and garlic. Add lemon juice to deglaze the pan and cook for 1 minute. Add Italian seasoning, lemon zest, and chicken broth. Stir in heavy cream [if you like your sauce thicker - you can thicken with a cornstarch slurry (if not low carb) or arrowroot starch slurry (or xanthan gum) by mixing 1/2 teaspoon cornstarch (arrowroot starch) mixed with 1 teaspoon cold water]. This look so tasty! I think it’d make a great addition to my meal too, thank you! I made this for supper tonight, delicious! I will make it again for sure! Thank you for sharing.. got my instant pot for xmas and loving/discovering it. Amazing. 👍🏼 DIDN’T maKe it in my instant pot. Made it in my All-cad slow cookeR. Can you post photOs on here?